How do I use KrisFlyer Spree? You must be a member of our loyalty programme KrisFlyer. It is free to join and registration can be completed in just a few minutes. We'll give you a membership number straight away to start shopping. You can register online now. Do I need to join KrisFlyer to earn miles when I purchase through KrisFlyer Spree? Yes. As long as you're a KrisFlyer member and have logged in and clicked through to the merchant’s site from KrisFlyer Spree, you can earn miles. Can I purchase from KrisFlyer Spree if I am not a KrisFlyer member? No, you must be a KrisFlyer member to purchase and earn miles. Join online – it’s free and easy. You must login to your KrisFlyer account and click on the "SHOP NOW" button. Once on KrisFlyer Spree, you can choose a merchant you want to shop with and click the ‘Shop Now’ button to be taken to the merchant's site. You must always return to KrisFlyer Spree to click through to each merchant you wish to shop with, as this ensures that any purchase you make is tracked back to your KrisFlyer account. Is it more expensive to shop via KrisFlyer Spree? No, you will not spend any more by using our site. It’s the same price as shopping directly with the merchants (so you won’t miss out on any of their special offers). However, by using our site you can earn miles on every purchase (excluding the purchase of gift vouchers, taxes, VAT and/or delivery charges). And our service is totally free! I am a member of a loyalty programme of a merchant, e.g. I hold an American Golf loyalty card. Will I earn miles for my purchase when I visit American Golf’s website via KrisFlyer Spree and login again as an American Golf member on their site? Yes, you will still get your miles but we would advise that you don’t purchase any items if you have previously saved them to your basket during your last visit to the American Golf website – this could affect receiving your miles. It’s best to start your shopping basket from scratch. The purchase journey needs to start with KrisFlyer Spree to ensure that the transaction is tracked back to us. I signed into my KrisFlyer account and made purchases via KrisFlyer Spree, but my purchases aren't showing up in my Account - what's going on? If you'd like help figuring out what's happened, contact us. Note that any claim for missing KrisFlyer miles must be made to us within 60 days of your purchase. My cookies are enabled but my purchases still aren't showing up in my KrisFlyer Spree Account? Make sure you are logged into your KrisFlyer account via KrisFlyer Spree login page. If you decide after check out that you want to purchase something else, close the merchant site window and start the process again from KrisFlyer Spree. Don't click on another banner or website promoting the merchant before you complete your transaction. If you must visit another site before completing your purchase, please use a different browser to do so. Interrupting the browser session that started from KrisFlyer Spree can affect the tracking of the purchase and therefore the miles to be earned. Telephoning the merchant to complete or modify your order will likely over-ride the KrisFlyer Spree referral (and therefore affect the crediting of your miles). Increasingly some advert blocking software programs prevent the special tracking codes we need to track your purchases, please disable such programs before using KrisFlyer Spree. If you’ve followed the above guidelines and your purchases still aren’t showing up in your KrisFlyer Spree account, please contact us if you’d like help figuring out what's happened. Note that any claim for missing KrisFlyer miles must be made to us within 60 days of your purchase. I forgot to log in as a KrisFlyer member before buying something on the merchant’s website. Can I still have my miles? Sorry, no. We're unable to retrospectively allocate miles. The next time you shop, always visit the merchant's website via KrisFlyer Spree so that cookies can track your visit and we can then allocate miles for your purchases. Are my miles immediately credited to my KrisFlyer Account? When you buy something from a merchant, the transaction will appear in your KrisFlyer Spree Transaction History as 'Pending' within 5 working days. Once 'Approved', the miles will be credited to your KrisFlyer account within 7 working days. Please check for the credited miles on your KrisFlyer account statement based on the transaction date. KrisFlyer Spree will clearly outline how many miles you'll earn. In most cases, this will be expressed as a number of miles earned per USD$10 spent at the merchant. If a merchant is offering 20 miles per USD$10 spent, and your transaction total is USD$50 (excluding tax and shipping), you can expect to receive 100 miles. Other merchants may offer a certain number of miles for a single purchase, or by registering for a service with that merchant. In this instance, you'll receive miles for that one action, but not for subsequent actions or purchases on that merchant's site. No. Miles will not be earned for postage/handling fees or tax paid for a transaction. Can I see my KrisFlyer Spree miles for previous shopping transactions? Yes. You can see all your transactions whether they are 'Pending', 'Approved' or 'Cancelled' within your Account page on KrisFlyer Spree. Why do I earn more miles with some merchants than with others? Merchants decide the level of miles given for shopping with them. Why have I earned more or less miles with the same merchant? Miles rates can go up or down, but the current rate is always displayed on KrisFlyer Spree site so remember to look at the current rate to know what to expect. You can cancel purchases and get a refund in the usual way that you would do directly with the merchant. However, you will not earn miles for any cancelled or refunded sales. I was interested in a merchant who is no longer listed, can you tell me why? From time to time merchants may decide they no longer wish to participate in KrisFlyer Spree. When this happens, they will be removed from our listings. 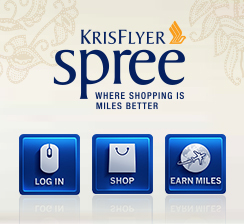 Can I use my miles to purchase products directly from KrisFlyer Spree? No, your miles earned through KrisFlyer Spree will be credited to your KrisFlyer account and you can then redeem your miles for KrisFlyer reward flights, upgrades and more. You can also mix your KrisFlyer miles with cash to pay for commercial fares on singaporeair.com. Full KrisFlyer terms and conditions apply. Will I be contacted by any of your merchants? KrisFlyer Spree will not share any personal information about you with our merchants. 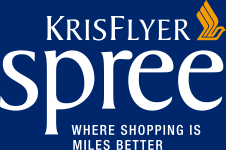 Please note though that when you click a "Shop Now" link to a merchant, you will leave KrisFlyer Spree completely and be subject to that merchant’s Terms & Conditions. If you leave your details with a merchant, they may contact you. A cookie is a small piece of data used by web servers to help identify web users. Cookies can be turned on and off by you at any time in your web browser menu. Cookies allow us to award your miles for any transactions with merchants. How are cookies used at KrisFlyer Spree for Shopping? How it works is that a piece of code on our merchants’ websites records your unique ID number and transaction, and then passes that back to us. We then use this to match it back to your details so we can allocate miles to your Account. What do I do if I’ve forgotten my KrisFlyer number or PIN? We can help you. Click here and follow the online instructions. How do I update my personal details on my KrisFlyer account? Login to your KrisFlyer account and follow the instructions. https://www.singaporeair.com/en_UK/ppsclub-krisflyer/my-personal-details/. Where will KrisFlyer Spree merchants deliver? You will need to check with each individual merchant for full details of their delivery options. If you select from the Regions in the drop-down box, you will be shown merchants from that region. Additional information pertaining to the delivery markets covered by the merchant is shown in the Purchase conditions on the merchant detail page. Merchants do change their delivery markets from time to time, and we recommend that you do a final check prior to placing an order to ensure that the merchant accepts your preferred delivery market. I’m not happy with the goods purchased. How do I refund / exchange the goods? When you purchase an item from a merchant, your customer/merchant relationship is the same as if you went direct to the merchant’s site and made a purchase. As such, KrisFlyer Spree is unable to assist with the handling of refunds and exchanges with the merchant on the member’s behalf. It would be best to check the terms and conditions on returning / exchanging items which should be found on the merchant’s site. Also, please do note that you will not receive KrisFlyer Miles for products returned to the merchant or for sales cancelled. I bought a product but it has not been delivered to me. How do I track the delivery status? You should check your order/delivery status with the merchant from who you have ordered. How does KrisFlyer Spree work? To understand how the mall works and how you can start earning miles while you shop with us, please visit our "How it Works" page. How many merchants do you have on your site? We have hundreds of merchants currently on our site covering a vast range of shopping categories and are always in the process of adding more!